Des is a life member of Ronhill Cambuslang Harriers and was involved in athletics for thirty years up to 1992 – then he took up bowls. He emphasises that he thoroughly enjoyed his time with athletics and has no regrets. He has some interesting memories of the Edinburgh to Glasgow Relay. “November 1979 and Baillie Hodge is all set to make the presentation of awards at the finish of the E to G. The venue? The steps on the Duke of Wellington’s statue (of traffic cone fame) at the end of Ingram Street. We had to ask a workman operating a pneumatic drill to stop making a racket so we could hear what was being said. Presentations over, the hierarchy – Ian Clifton, Bob McSwein, Brian Goodwin and a couple of others, along with Baillie Hodge – adjourned to a small hotel in Queen Street for refreshments. What about the athletes, officials, spectators? Nothing. No showers, no food, nothing. Hard luck – tough. The next day at work I had my weekly meeting with my boss, Jim Welsh, the Scottish Regional Sales Manager for Barr’s (of Irn Bru fame). At that time I was the Glasgow Sales Manager. We always cleared up the sales situation then moved on to the weekend sport. Jim was a golfer and a supporter of Falkirk FC (somebody had to). Earlier in life he was a member of Falkirk Victoria Harriers and in 1956 ran for them in the E to G (which was a surprise to me). He knew of my involvement in athletics and asked how the E to G had gone. I told him and explained that, after never knowing how we stood with The News of the World, they had finally pulled the plug the previous year. Wee Bob Dalgleish thought there would be no problem finding a replacement sponsor, such as The Herald or The Daily Record – someone would surely step in. How wrong he was……. Jim asked me what was required as he remembered the days of the Ca d’Oro and what it was like when he competed. I didn’t think we could aim that high but felt that something more modest but giving the chance for friends and family to be involved could be achieved, so he gave me the nod to raise the matter with the committee of the SCCU. They were delighted to hear my proposal as they had no ideas and genuinely feared for the future of the great event. As my reward, I was instantly elected as Convenor. The first year we used Strathclyde University for afters and things went quite well. However when I contacted them the next year the hire cost had exploded. We needed a new venue. 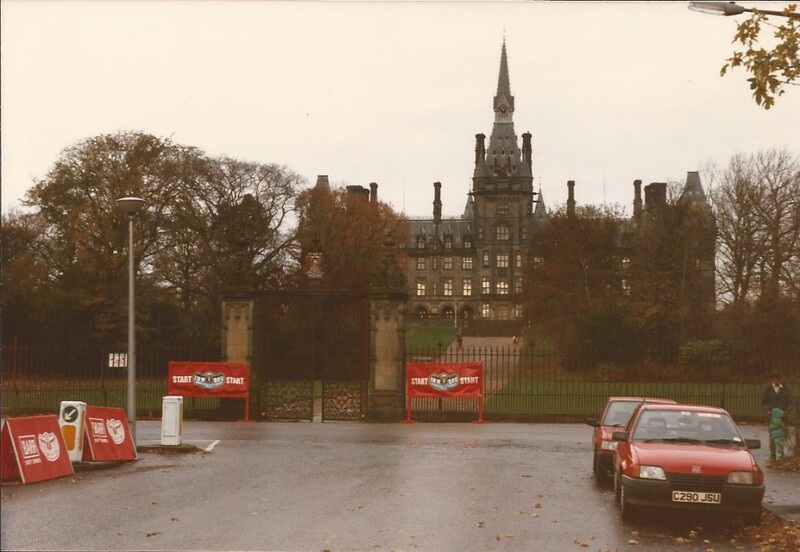 Allan Glen’s School was happy to provide facilities to shower and eat but could not supply staff so I was left to coax my mother, mother-in-law, wife, daughters and numerous wives, daughters and members of Cambuslang to do the feeding. I was also left with the task of providing everything required to feed 360 to 400, since wives, girlfriends, pals and supporters would be able to come in and enjoy the prize-giving. That arrangement worked for a few years and then I moved on to the SAAA committee. However Jim Scarbrough replaced me as Cambuslang representative on the SCCU, so he became Convenor and we worked things out together. That was okay for a while but we soon found we were competing with busy shoppers and switching on of Christmas lights in George Square, so Jim decided to exit the city centre and change the finish to Crown Point. I have had a computer for about four years now and thoroughly enjoy reading articles on Brian McAusland’s websites. However I get a little annoyed by some of the criticism of what we provided. Okay, it was basic, but it was a lot better than the way the race finished in 1979! I had been compiling information about the E to G for several years with the idea that Barrs would have the material printed in booklet form and distributed after the race. Colin Shields at the same time was working on ‘Whatever the Weather’. When he completed a section he brought it into Barrs and a secretary typed it up for printing. She was often unable to read Colin’s handwriting and would phone me to help her out. Ultimately, Colin admitted he was well behind schedule and asked if he could use the material I had gathered, as he was including a section on the E to G. My contribution would be suitably acknowledged. That turned out not to be the case. I was listed in the general list not noticeably attached to the E to G section. The idea for a Barrs booklet was then dropped and they settled for an advert in Colin’s book instead. 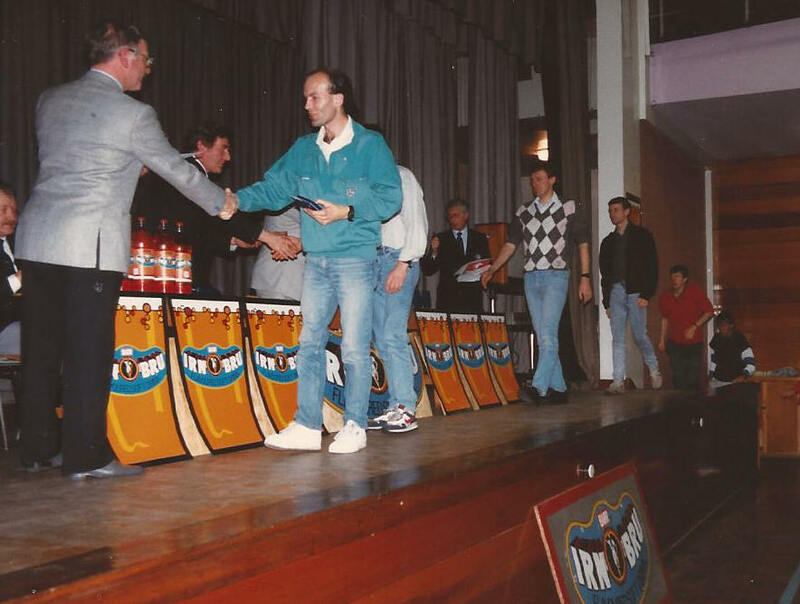 Before the 1991 E to G, as I had been compiling info on the race, I alerted the committee that you (Colin Youngson of Aberdeen AAC) were about to make your 25th appearance in the event. They unanimously agreed we must recognise that fact. 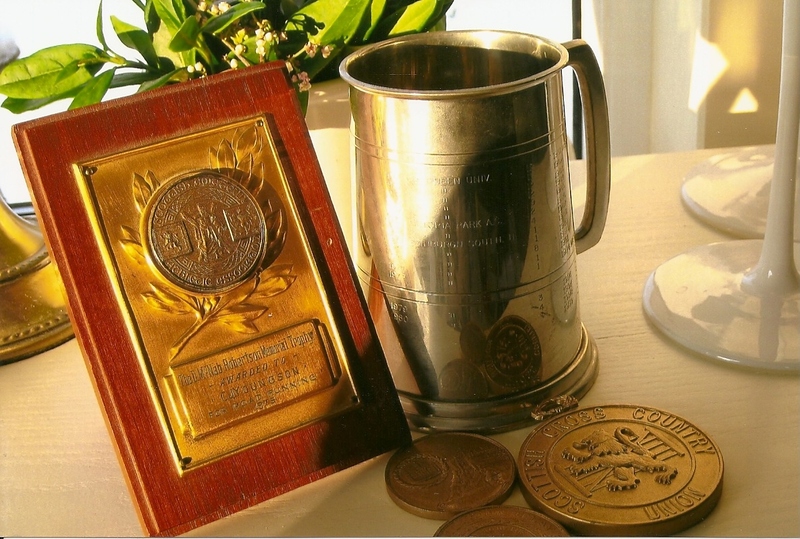 After various suggestions – plaque, medal, certificate etc – it was agreed that a tankard suitably engraved was the most suitable memento. I think somebody did mention that you enjoyed a pint! Colin’s tankard and two types of E-G Medal: the smaller is the older version with engravings of the two cities on it, the larger is the newer one. At Cambuslang, the strangest request we ever had was the late 1970s when Willie Kelly, a contemporary of Andy Fleming and Gordon Eadie, informed us that when he was up in Aberdeen on business he had met Alastair Wood, a Scottish and GB International athlete who was now in the M45 age group. Alastair had apparently severed his connection with Aberdeen AAC and amazingly elected to run for Cambuslang. This he did on a handful of visits and when he was down I put him up in our spare bedroom, as Willie could not accommodate him. A truly great runner and an amazing character. Always seemed to leave something behind – specs, toothbrush, one shoe…. Sadly I have in recent years attended the funerals of far too many athletic friends. Alec Naylor, Bill Scally, Ron McDonald, Tom Fletcher and others. At these I have had chats with Don Macgregor and Ron Morrison from St Andrews, Neil Donachie, Colin Shields, Colin Martin and Danny and Molly Wilmoth. Recently I met Andy Brown. Andy has had a knee op but still looks very fit. Best captain Scotland ever had! In the nineteen years that Barrs assisted with the E to G, Jim Welsh never took up the invite to attend. It was always golf or football for him. However the gesture he made allowed the great race to carry on for that length of time. I know it is missed and that we will never see its like again. How sad. Through the years I have given lots of material to assist club publications. Dave Cooney for Cambulang’s 50th Anniversary in 1998. John Mackay for Shettleston’s 100th in 2003. He got 20 years of Athletic Weeklys. I still have 1980s Scottish Marathon Club magazines if anyone wants them. I only recently discovered many photos of the 1988 E to G and thought you should have them, since Aberdeen AAC won the race. Aberdeen’s last stage runner, Colin Youngson, with Glasgow Lord Provost. Note Danny Wilmoth, Harry Quinn and Bob Dalgliesh. That’s where Des’s reminiscences stop and I’d like to say that I agree with all that he says – when Scotland was involved as of right in the World Cross-Country Championships, to be captain was a singular honour. It is no disrespect to Jim Alder, Lawrie Spence or any of the other fine athletes and men who have held the post when I say that Andy Brown is the one who comes to mind first. It is also true to say that the Edinburgh to Glasgow was the finest road race of the winter season bar none and it will never be replaced. The really excellent work done by Des, by the totally unsung Jim Welsh, and by Barrs in doing the heavy lifting to keep the event on the road should not be under-estimated either. But then Des was a real runner’s man. He was always a good clubman. 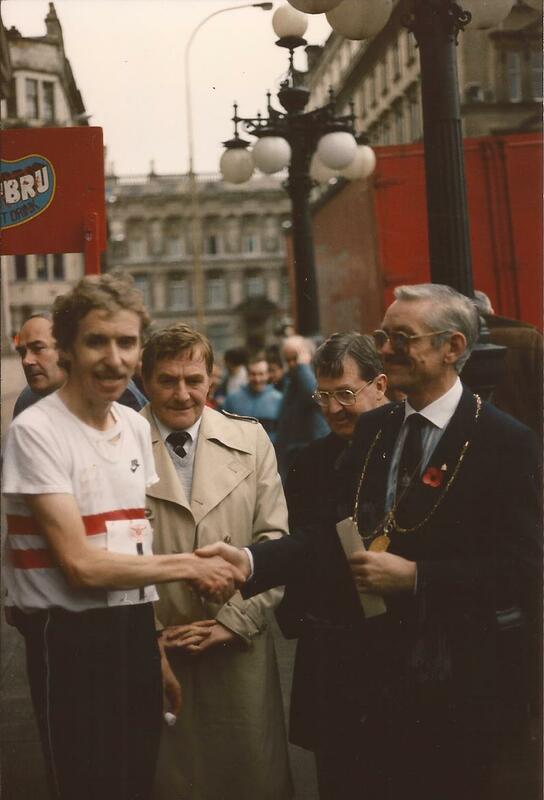 He started out with Maryhill Harriers and I used to see him with his buddy Ronnie MacDonald running along the Boulevard in Clydebank when he lived there. He worked hard for Maryhill – like a good clubman he did what his club needed him to do. Then he moved to Cambuslang and joined Cambuslang Harriers and threw himself into making that a success as well. He worked with club teams, district teams and national teams but the best that he ever did for the sport was in his work with the Edinburgh to Glasgow Relay. The only difference in the programmes when the News of the World stopped sponsoring the race, was that the paper was less shiny and the photographs were missing. All the info about the teams and the race itself, past performances, etc was there. It really was a wonderful rescue package at very short notice. As an administrator and an official he was of the first order and let’s not forget, that he came into the sport as a runner and although not a record breaker or international, that’s where the love of the sport came from. In fact, Hugh Barrow was a story about Des training at Huntershill at lunchtime and restricting himself to the track so that his drivers couldn’t see him from Auchinairn Road! 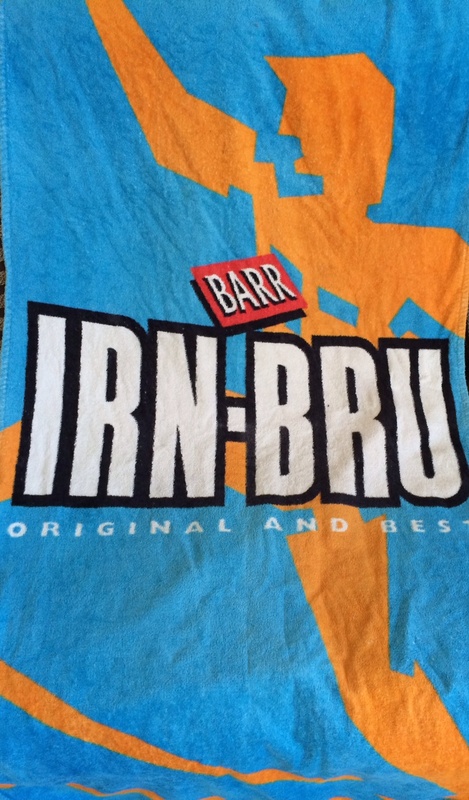 Des and Barr’s were for many of us synonymous and the big, Barr’s towels were greatly prized. 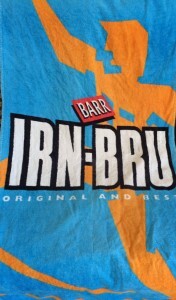 I remember when three of our training squad (Jim Orr, Alex Gilmour and Eddie Stewart) were selected for and ran in the world cross-country championships in New York, I was presented by Jim Orr with a Barr’s towel and told I was an honorary member of Cambuslang Harriers. Hugh Barrow, who won one at a race in the mid 80’s sent me this picture with the comment “better than fish knives from the Co-op”.